What are flexible pricing plans? EnergyAustralia has a new way of charging for Victorian smart meter electricity use, called flexible pricing (or ‘time of use tariffs’). 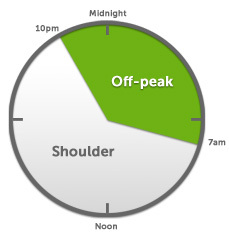 These new plans charge different rates for peak, shoulder and off peak. You’ll typically pay higher rates for the electricity used at peak times, lower rates during the shoulder period and the lowest rate at off-peak times. Flexible pricing products are available in addition to our current products and can reward those who use electricity during lower cost times. Victorian smart meter customers have the choice to move to flexible pricing plans or remain on their current flat rate plan. Who will be eligible for flexible pricing? Victorian residential customers with remotely read smart meters. What is the difference between a time of use product and a flexible pricing product? The existing time of use products do not need a smart meter, just one that can take the multiple readings of peak, off-peak and shoulder. These three time bands also differ from the new Flexible Pricing plans. Who could save money on a flexible pricing plan? 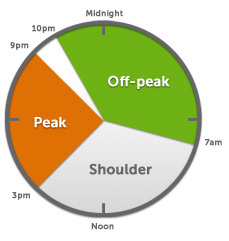 Households who regularly use electricity in shoulder and non peak periods or who are willing to change their behaviour to using electricity in non peak periods. Not all households will be better off on a flexible pricing plan, for example those who use more during peak times (3pm-9pm Mon to Fri) and can’t or are unable to change their usage patterns may have higher bills on a flexible rate plan. If you are on a controlled load meter feed (pool pumps/underfloor heating, etc) you may not be better off on a flexible pricing plan. This is because some controlled load rates allow for a “boost” load in the early afternoon which would mean that you would incur shoulder and/or peak usage rates at this time. You could choose to change the setting of this if you wanted to take up a flexible pricing plan or stay on your controlled load plan. (Flexible pricing plans are not configurable with a controlled load). I am currently using a lot of energy in peak times, if I switch to a flexible plan can I get a refund? Unfortunately you are bound by the rates of your current plan until such time as you might change plans. Are the flexible pricing plans available to small business customers in Victoria? The new flexible pricing products are currently only available for Victorian residential customers with a remotely read smart meter. Are there residential flexible pricing plans available for gas? No, these products are for electricity only as they’re linked to smart meters. What if I’m not happy with my flexible pricing plan? We offer three flexible pricing plans for Victorian residential smart meter customers, so you can choose what suits your household best. If you wish to change to another flexible pricing electricity plan, you can. What’s the difference between the current plans vs flexible pricing? Flexible pricing allows you to pay lower rates in shoulder and off peak periods compared with other plans that do not have this time structure. How do I take up a flexible pricing product with EnergyAustralia? Current EnergyAustralia customers simply call us on 1800 120 084. What if I want to change back to my current rate structure? Your previous rate may no longer be available. Please contact our call centre on 136 102 to see what plans we have that suit you best. Can I take my flexible pricing plan if I move? Yes, as long as the new home has a remotely read smart meter and is in Victoria, please note different rates will apply for different distribution zones. Why are there bigger discounts on some current rate structures? The flexible pricing plans have a 15% pay by due date discount. The benefit of flexible pricing is you are in control of when you use energy and therefore which rate you are charged at and for how long. Carefully assess which plan will be the best discount or rate for your usage patterns. Can I get my Solar feed in tariff on a flexible price product? Yes you can, unless you are in the SP AusNet distribution zone. SP AusNet is currently experience difficulties in applying feed-in tariffs for customers who switch to a flexible price. Can I access a flexible price if I am already on a time-of-use product for my solar installation? Yes you can. You should, however, consider the differing times and rates for the flexible offers in comparison with your existing product. If you are receiving a feed-in tariff this will not be affected by switching to a flexible price, unless you are in the SP AusNet distribution zone. How do I know if I will be better off with a flexible rate plan? Not all households will be better off with flexible pricing. If you use more during peak times and can’t or are unable to change your usage patterns you may have higher bills. Flexible pricing could result in lower bills for households that already use less of their energy during peak times and/or would be willing to change their use to off-peak times. Current electricity discounts should be taken into consideration when comparing. Call us on 1800 120 084 to see if flexible pricing is for you. What changes will I see on my bill? Flexible pricing bills will display usage and costs split by peak, shoulder and off peak periods.